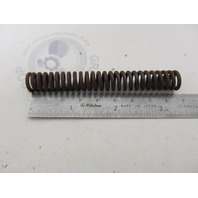 This prop shaft spring is for use on some vintage 50-115 HP Evinrude Johnson outboard engines from 1972 and older. New OEM OMC part, old stock. It may have some storage wear. Please check the part numbers for your specific fitment needs. Over 15 Years Of Outboard and Stern Drive Mechanical Experience! We are Mercruiser, OMC Stern Drive, Evinrude, Johnson, Mercury and Mariner Outboard Parts experts. Feel Free to Call or Email. Thanks for Shopping.